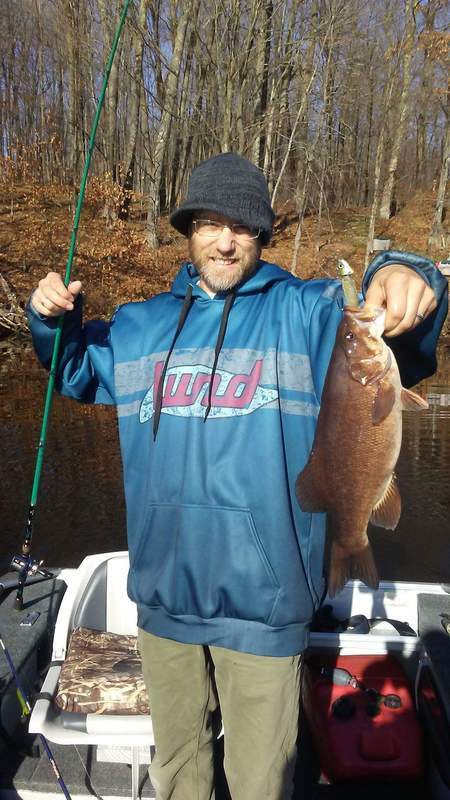 Fall smallmouth myths - WELCOME TO JAMES GANG FISHING CO.
One day I was crawler fishing the Chippewa River downtown Eau Claire at 18 years old, hoping for some white suckers, redhorse, or the occasional accidental lake sturgeon to throttle my line. This day I hooked into something different, something that fought like no other for its size. I reeled in a fish that I was unsure what it even was. I had never seen one before. My buddies told me that I just caught my first 3 lb smallmouth bass. From then on, I was HOOKED. Unfortunately, not being a boat owner, its hard for a kid around town to consistently fish smallmouth bass, or even learn their habits, being a bank angler in Eau Claire. I had a very poor income, and cheap kayaks and inflatables were not around yet. When I was near my mid-20s, I got $400 together and bought a 10 foot jonboat. I slapped on a 1969 Evinrude 4 hp, and my fishing life instantly changed. I was able to access the smallest waters, the worst ramps, or even throw my boat in from a ditch. I didn’t use a trailer, I threw this tippy pile of aluminum in the back of my truck and began catching smallmouth bass. I substituted the power worm for the Berkley Power Tube and fished it the exact same way. I also learned how smallmouth loved topwaters, spinners, and other really fun lures to throw. Then the day I learned how to jerkbait fish, about 10 years ago, that’s when I really started catching them in numbers. One day, late October 2004, I was in the jonboat throwing a big white musky bucktail for trophy smallmouth bass, or at least that’s what I thought I was doing. In reality I had no clue what I was doing. I pounded the banks and really was just catching them with “luck” back then, I didn’t understand fish location at all, unless they were under a log. I hooked into a pile of dead weight, this thing didn’t even move. I remember the leaves were all on the lake bed at this point, I was in full winter clothing, water temps were probably in the low 50s but I didn’t have a gauge with. When I horsed in my slow-moving fish, I netted the tallest looking smallmouth bass I ever seen in my life. This fish measured 20” and I was shocked. I freaked out. I wanted to release him, I am not about keeping smallmouth bass, but he throat hooked his gullet bad, bleeding all over. I put him in my homemade livewell, and he laid on his side. I continued to fish and kept changing the water. I caught a pike that was 24” and put him in. They looked almost the same length in the livewell. Finally the bass seemed to recover, sat upright, and looked great. I released the pike, and found a local old guy to take a picture of me with the bass, I then released the bass as he swam away like he was fine. Looking back maybe I should have mounted him because his survival rate was very poor, but who knows. Maybe he did survive after all. I was super excited to tell all my friends and co-workers about this fish. They all told me you just experienced fall smallmouth fishing, the greatest time to ever catch them. They put on a “feed bag” all fall long and all that you catch is 5 pounders constantly. I couldn’t wait for the following fall to do it again. I never fished fall in the past because of the bow hunting season starting in mid-September here in Wisconsin. Most people winterize their boats mid-September and shoot their bows and sight in their rifles. Non-deer hunters are usually small-game hunters and no one is worrying about fishing besides the musky guys. The following fall I tried fishing my booty off. NOTHING, I read magazines and all of them pretty much said that you will catch a five pounder on every cast you throw all fall long, when the water is below 63 degrees. The magic lure is a topwater, a spinner, a swimbait, a tube, a hair jig, a grub, a blade bait, or a crankbait. Throw any of these lures and you will hammer bass every cast, all wall hangers, because the “fall feedbag” is here. I tried and tried and tried with no success for about a decade, reading and reading, trying to find them on contour maps, using flashers, going by BAD information from people I know. It got very very sickening. I began communicating personally with many professional anglers and a few famous guides through social media a few years ago. Also I have a Facebook account pretty much just to talk fishing with these guys. What was neat to see was the honesty from these pros on there. Yeah, they caught some giants in the fall and posted them, but in reality, I seen some very dominant anglers posting how they struggled A LOT. You don’t see a pile of pro bass tournaments in the fall. And you don’t see limit after limit filled in the Bassmaster Opens in the fall, either. I became friends with a famous guide, former professional walleye angler, Freshwater Fishing Hall of Fame member Dale Stroschein a few years ago. Telling him about my struggles, my buddy and I decided to hire him for a day in late October. We knew his giant catches of smallmouth were legit. When you talk about the Great Lakes, the amount of old fish present is incredible. When you talk about 5 pounders, this place actually HAS THEM. As well as Mille Lacs, and a few other well-known trophy fisheries. Dale taught us the correct way to search for fish. What was really exciting is when we arrived, Dale showed us pictures of the FORTY smallmouth they caught the previous day, two of them over 6 pounds!!! And no he didn’t say they were six pounds, he did this crazy thing called WEIGHING THEM. I always thought I was a less-than-talented fisherman because I weighed my fish and never caught these 5 pounders that everyone catches every day. I guess when you are young and naïve, you actually believe people when they talk to you. That’s the first mistake in fishing. Don’t trust anyone until you really figure them out and witness them back up their talk once in a while! Dale had a 6-3 and a 6-2 on a DIGITAL SCALE. These things were crazy tall. That’s when you know you are dealing with true giants. The following day, we were fishing in very shallow water, but super clear water. I thought Dale was nuts fishing this shallow in this clear of water. On my second cast, I already hooked into a 3 pounder, in which I lost near the net. We were throwing minnow profile lures, and he explained the fall pattern to us, in an honest way that actually makes sense. The statement Dale made to me that I will never forget, is that “THEY HAVE TO FEED IN FALL. IF YOU ARE NOT CATCHING THEM, YOU ARE NOT NEAR THEM. MOVE UNTIL YOU FIND THEM!” He was absolutely correct. But I suppose when you are talking about a Hall of Fame legend such as Dale, I guess he should know what he is doing. What else really made my day, and probably not Dale or my fishing partner’s day, is that we struggled. But it taught me how to understand fall fishing. We fished and fished and fished the “FALL FEEDBAG” and in 10 hours and 8 trillion casts, we only managed 10 bites. Nothing near the previous day Dale had with his clients, but here is the kicker, I mean kicker like tournament kicker, they were GIANTS! I landed 5 pounders. Like the kind I catch every 10 years here, I caught them pretty much every fish I reeled in with Dale on this tough fall day. And being that Dale landed two verified 6 pounders the day before, I really believe watching my partner Mat, and Dale both battle some giants and lose them, I think both of those fish could have been the 6 pound class. I can’t say that without actually landing them and weighing them on a digital scale, but they fought them harder than my 5-5 lb did that day. I finished the day with a 5-5 around 22”, a 5-2 around NINETEEN INCHES (17.25” girth????!!! ), a 4-14, and a 3-12. Mat landed a 3 lb and Dale landed a 4 lb and a smaller one at sunset. So even though the “FEED BAG” was on, it was very difficult fishing. On a world-class lake like Lake Michigan, it’s worth the work to catch giants like that. I took Dale’s advice and tried his tactics on a local reservoir in November on a warm sunny day. I skipped bowhunting in 67 degree air and hit the lake with a buddy. Water temp was at 48 degrees. I figured they would be by shore shallow near the winter hole, or on the edge, feeding on minnows instead of the billions of crawfish that live in this lake. We hammered the wood cover, the shallow to mid range depths for one pass. Nothing. We marked a pile of fish on the bottom in very deep water with my Marcum ice fishing flasher. I put on a ¾ oz VMC Swimjig head and a 5” swimbait that I poured in my driveway, cut 1” off the head, dipped the tail in Spike It blood red garlic dye, and casted it. My partner Kevin was throwing the same thing as well as a Flappin Jig. We had 8 bites and landed the fattest, most beautiful 16-16.75” smallmouth I ever seen, weighing 3-14, 3-13, and less. Basically 4 pounders and they weren’t even 17” long!!! The guts were full of minnows bulging out of the sides, and it was obvious that the real “FEED BAG” was going on. But we casted and casted and fished very hard for about 3 hours, had a crazy awesome day, and still only had EIGHT BITES. Now this particular lake probably isn’t loaded with old 5 pounders like the Great Lakes, it is loaded with cabins and fishing pressure. So that is why I was so pleased to catch these thick, girthy sows with consistency. If this was the Great Lakes or Mille Lacs, I would hope those would be 5 pounders. 5 Pounders are only relevant where 5 pounders live somewhat abundantly. You have to be realistic in your fishery and understand the amount of forage available, and the cyclical changes that occur over the years that change the quality of fish, the health of the fish, and the survival rate. To grow a 5 lb bass in northern states, they need to get OLD. PERIOD! If someone is constantly limiting out on 5 pounders in your area in northern Wisconsin, more than likely they need to get their spring scale checked because its just a rare kind of fish to find. Compare a 5 lb bass to a Pope & Young buck and a 6 lb bass to a Boone & Crockett. Very very rare. Besides that, a fish does NOT have to be 5 pounds to be something to be proud of. I go nuts on ANY bass that is legal, and a 3 pounder gets me ready to do cartwheels. Typically in our local tournaments a few 4-5s get caught but most of the fish weighed in are in the 1-2 lb class. Watch Major League Fishing and see how many legal bass caught are 1 pounders by Kevin VanDam and the boys. And they get excited about it. This year, we had a warm September. Water temps in the Great Lakes on September 24th were around the July temps. Locally we stayed around 70 degrees or more most of the late summer period and actually went up later in September with a crazy front that pushed water temps around July temps. Believe it or not, there were several people on social media blabbing about the fall feedbag bite while catching small fish on small baits in crazy shallow water, and lots of them on topwaters. A buddy and I caught some puking up black larvae. That would be the complete opposite of a feeding binge, they are eating microscopic food and tiny bugs. So in the future, I will refer to these ridiculous fools as “FEED BAGGERS.” They are the reason why the fall bite is so misleading. You need to listen to the fish, and not the hype of anglers that have nothing better to do than BS on fish weights and numbers to pretend they are better than others. If you put yourself in the right place at the right time, you may intercept the traveling schools of older bass that are searching and feeding You may catch the biggest fish of your life in the fall, and you will notice the small fish kind of disappear. I believe the reasoning for this is that their cold-blooded young bodies can’t deal with the huge water temp drop, and their metabolisms just shut right down. That is one truth I have witnessed in the fall – the average size of your bass caught is bigger. The older ones do feed heavy, it is in their instinct. But you really gotta work for them. Its not easy at all. The guys that are really good at it are very experienced and have done it a very long time. So you want to know the moral of my story? Ok here it is. 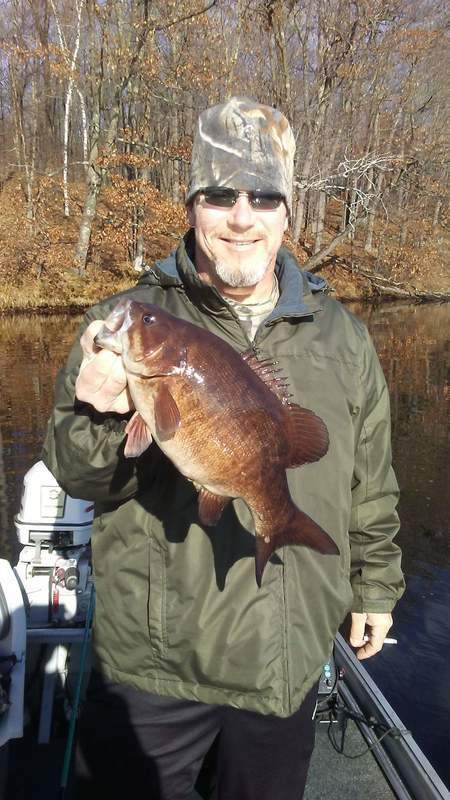 Fall fishing for smallmouth bass can lead to some incredible fish catches. The average fish sizes are usually larger than any other time of the year. When you find them, they are usually in schools and you can catch a limit or more of very quality fish. They will bite until water is very cold, even in the 40s. They seem to shift to a minnow shape forage bite. Most days are a challenge, and you must prepare to move frequently and cover a lot of water until you find them. Searching staging areas near winter holes may be the key. The fish will weigh more than any other time of the year due to their stomachs being bloated full of forage. Fall fishing is not easy at all, and you must understand fish movement and fish location to get a basic start to your search. Smallmouth bass will migrate very far in the fall, day to day, hour by hour in search of food. 74 degree water temp in Wisconsin is NOT a sign of a fall feeding binge. Black larvae getting vomited out of a fishes gullet is NOT A SIGN of a fall feeding binge. And last but not least, never listen to FEED BAGGERS. Every body of water is very unique, you need to learn each one you fish and approach them differently. Hopefully a bite or two from the fish will give you hints on what in the world they want that day! !